If you don’t have time to cook, there are really good restaurants around that offer Kare-Kare for restaurant delivery. But personally, I prefer the home cooked Kare-Kare especially the ones prepared by my late grandmother. And Kare-Kare wouldn’t be exciting to eat without bagoong alamang (shrimp paste or shrimp sauce). You can make your own bagoong alamang or buy the bottled one. For my home made Kare-Kare, I used beef meat (cubed). I put in about a cup of peanut butter and Kare-Kare mix and dissolved it with beef stock (pinaglagaan or pinagpalambutan ng karne) and let it boil with the beef meat until the sauce thickens. For the veggies, I added blanched sitaw (string beans), eggplant and pechay (pak choi) before I served Kare-Kare. Next time, I’ll try to cook Kare-Kare using oxtail, offal or tripe. 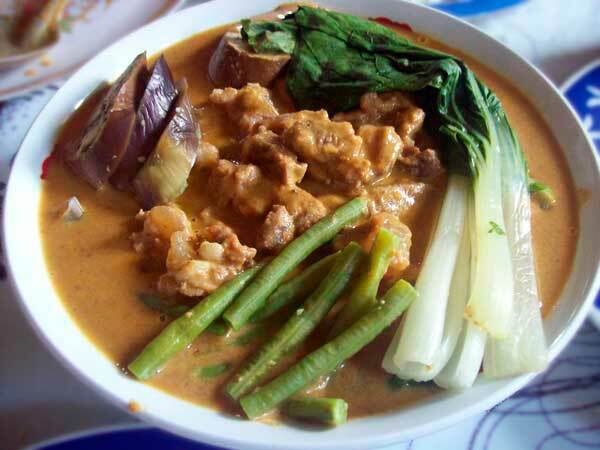 This entry was posted in All Year Round Food, Favorite Food and tagged Beef Kare-Kare, kare-kare, kare-kare ingredients on February 8, 2011 by Yami. I always use OXtail for Kare-kare and now,you make me creaved for it! favorite ko yan! 😉 that looks yummy!